"From the makers of "monks: the transatlantic feedback" (German Adolf Grimme Award 2008) come two new direct cinema style documentary films. One about the pop avant-garde music festival Klangbad, curated by legendary Hans-Joachim Irmler (founding member of the seminal Krautrock band Faust). The second film captures one of the rare live performances by Faust. There are two kinds of rock festivals: the conventional and the adventurous ones. The former present music that everyone knows. Others are more experimental and put their ear into boundary zones. 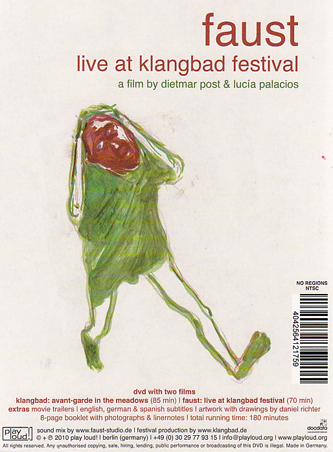 The Klangbad Festival, curated by Faust's Jochen Irmler, belongs to the latter. Since 2004 the picturesque village of Scheer hosts an innovative musical journey crossing various genres. In today's profit-oriented event scene it is hard to find anything comparable. The festival is small but growing constantly. Despite this fact, it abandons commercial sponsoring funds unlike normal open air festivals. Award-winning filmmakers Dietmar Post (USA/Germany) and Lucia Palacios (Spain) portrait this fine festival in the style of direct cinema pioneers, such as, Murray Lerner, Albert Maysles and D.A. Pennebaker. Monterey Pop, Gimme Shelter or Newport Folk Festival? 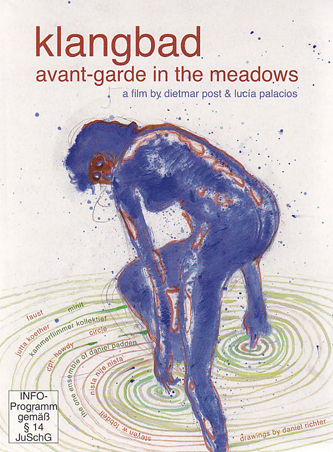 "Klangbad: Avant-garde in the Meadows" stands in that same tradition of carefully chronicling an event."